Even when the Patriots aren’t supposed to be as good, they’re great. I’m reading the complete Harry Potter series for the first time this year; and, I’ve yet to discover anything in J.K. Rowling’s books as mythological as New England’s 2018-19 season, thus far. Super Bowl LIII is here and it’s fitting that the Patriots have a date with the NFC Champion Los Angeles Rams of Saint Louis, because this matchup is Hollywood-worthy in a plethora of ways. Bill Belichick and his battle-tested army square off with his counter: the young, fearless Sean Mcvay. Mcvay and the explosive, tenacious Rams pose a unique challenge to a New England squad that, as the season progressed, seemed an unlikely championship contender. Yet, their appearance this year carries a strange aura of inevitability. If you’re a returning customer to my columns, you’ll know that I stood firmly by my thesis stating this team, weathered as they are, had no chance. Even as New England navigated this playoff run, they looked more like 2018 Rocky, than the 1976 one. They barely escaped Andy Reid and the Patrick Mahomes-led Chiefs. Kansas City’s potent offense pushed Belichick’s team to the ultimate brink. It took overtime, and a highly controversial call reversal from a punt muffed off the thumb of Julian Edelman. Well, much like rap icon Kendrick Lamar, I’m humbled. First off, at the outset of Super Bowl week, Tom Brady revealed in an interview, that the 53rd renewal of America’s biggest game, will not be his final NFL contest. How long can he keep this up? How long can this franchise keep this up? The New England Patriots are the greatest sports dynasty of all time. I can proclaim this with iron-clad certainty, because I can’t compare them to anyone but themselves. The more that time elapses, the more heroic this team’s success becomes. The prolific duo of Brady and Belichick stand at the precipice of their sixth Lombardi Trophy. Only twice during this era, which spans nearly 20 years now, has an NFC contender stared in the face of the devil, and punched him in the mouth. Once on the strength of David Tyree’s legendary helmet catch, and once versus Philadelphia’s backup quarterback. This team’s value is appraisable only to other Patriot greats, it begs comparison, so let’s do that. The 2018-19 Patriots went 11-5, suffering blowout losses to Tennessee, and, the Lions. The Lions. Let those last syllables echo in your mind. Losses like that suggest more than attrition for the team’s seemingly immortal appearance. This year’s edition beats you in a lot of creative, playbook expanding ways. Edelman poses a threat in the backfield, on deep balls, and on special teams. He’s like the Swiss Army Knife of football players. Then, you have Sony (Playstation) Michel, a versatile and reliable back, filling a need New England has often had. Beyond the individual performers, the Pats run plays which serve in the interest of getting the football out of Tom Brady’s hands. Because of this strategy, Tom enjoys staggering longevity. He puts his team in positions to win because he’s elusive and he gets rid of the ball with whiplash-inducing quickness. They run flea-flickers, end-arounds, and anything to keep a drive clicking with confidence and efficiency. It’s a different formula than previous championship years, including the last time last New England and Los Angeles (Saint Louis), met. The year was 2002. Austin Powers: Gold Member was a year away from release. The iPod had a click-wheel. And, U2 performed the halftime show. That game also played out in a dome, the Superdome, in New Orleans, Louisiana. Those Patriots were scrappy too, finishing the regular season with a 9-7 record. Unlike the current squad, the 2002 Pats won with clutch defensive playmaking from guys like Mike Vrabel, Lawyer Milloy, and Antowain Smith. That year’s club won in front of a nation still reeling from the horrors of September 11th, which occurred only months prior. We face relentless adversity today too. I’d be remised to go without mentioning the enormous shadow cast by the Colin Kaepernick predicament and the seeming lack of sensitivity of the League in its ongoing response. 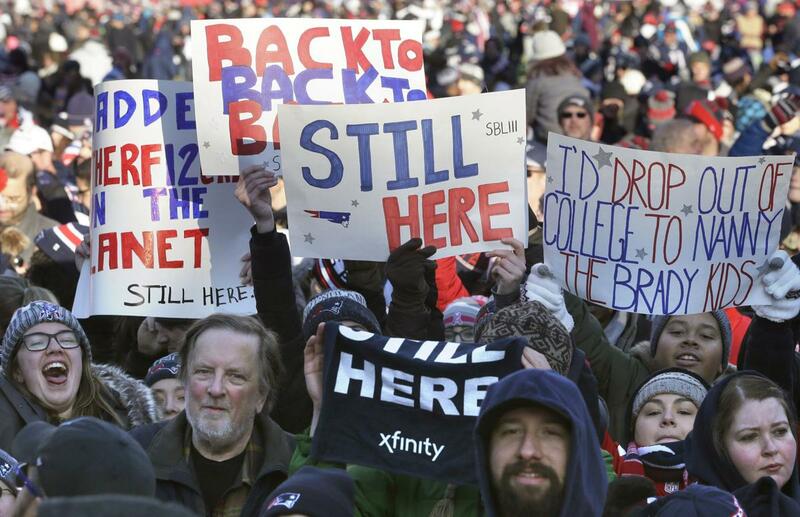 The 2002 Patriots were the team that people outside the Boston-area championed, because their resilience and triumph marked a return to normalcy. The 2002 Pats were, in many ways, heroic in their time and place. But, no one could have predicted the type of dominant success this franchise would claim in the years to come. Let’s jump to perhaps their most improbable win, Super Bowl LI. Number 51. You know, the one where they erased a 25-point second-half deficit against the Falcons in front of Lady Gaga and a delirious NRG Stadium crowd. Atlanta’s menacing defense haunted Brady; and, at times it looked as if the dynasty was over. But like Jon Snow’s usurpers in Westeros, Atlanta forgot that even a perceived death can’t stop a comeback. 2019’s squad is not like that. If they get down big to LA, they’ll stay down. Jared Goff is the next big thing, in the upper echelon of his other newcomer peers like Andrew Luck, and Patrick Mahomes. He leads some serious artillery on offense. Fantasy superstar Todd Gurley is primed for his first big-stage moment. And, go-to receiver Robert Woods offers a consistent downfield threat. The Rams’ defense needs no introduction; Aaron Donald and Ndamukong Suh await the upcoming challenge, lurking behind a defensive line that wants to keep the Patriots out of Orlando International Airport and a photo-op with Mickey Mouse. The outset of Super Bowl L3 is rich with intrigue: a New England loss could signal a figurative passing of the torch to the new school titans. A loss would certainly force Robert Kraft’s hand on drafting an heir to Brady, come late-April. But, a win? A win would send the Patriots’ story straight to the desk of Kevin Feige and the top brass at Marvel Studios. They’re a studio known for writing fantastical stories, filled with adventure, action, and suspense. That sounds an awful lot like the 2018-19 Patriots: Superheroes in their own right, attempting to write an epic final chapter. The world will be watching, are you ready yet?